There are several laparoscopic techniques in clinical practice that provide good results. Standard transperitoneal, hand-assisted, or retroperitoneal laparoscopy are all techniques that are commonly used. Each technique is associated with advantages and disadvantages, which are shown in Table 3. The authors prefer a standard transperitoneal approach. The main advantages of the transperitoneal approach are twofold. First, the transperitoneal approach allows for a large working space and good visualization of the entire operative field. Second, in cases of surgical emergency and conversion to an open technique, rapid visualization and access to the great vessels is optimal with the transperitoneal approach. The disadvantage of the transperitoneal approach is the dissection of the intraperitoneal organs in accessing the retroperitoneum. Mobilization of the intra-abdominal organs exposes these organs to potential injury. Some centers use the retroperitoneal laparoscopic approach for donors (68,92,93). The main advantage of this approach is rapid access to the kidney with minimal dissection. The main disadvantages of this approach are twofold. First, the small working space afforded in this approach allows more limited visualization. 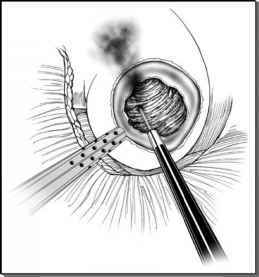 Second, in cases of surgical emergency, rapid access and visualization of the great vessels may be cumbersome. A group in Tokyo recently performed retroperitoneal laparoscopic donor nephrectomy and removed the kidney at an extraperitoneal suprapubic extraction site (93). This combination may well prove the least morbid for the doors. Most surgeons, however, are more familiar with the transperitoneal approach and, therefore, it is likely to remain the most popular approach. Rudich et al. reported good results with the hand-assisted laparoscopic approach (94). The main advantage of hand-assisted laparoscopic surgery is the ability to maintain tactile sensation. Because of the tactile feedback and the ability to use effective compression, the actual conversion rate for hand-assisted laparoscopic donor nephrectomy is lower compared to that for standard laparoscopy. The 1.2% conversion rate for handassisted laparoscopic donor nephrectomy is half of the rate for the other approaches (Table 1). Many argue this advantage of hand assistance may lower the steep learning curve associated with pure laparoscopic techniques. The main disadvantages of handassisted surgery are forearm fatigue that the surgeon experiences at the site of the hand port and cost of the device. Hand-assist devices add considerable cost to the procedure, which Wolf et al. estimated as high as 11% of the total operating room cost (95).